We are fortunate today to have LA Dragoni visiting our blog. 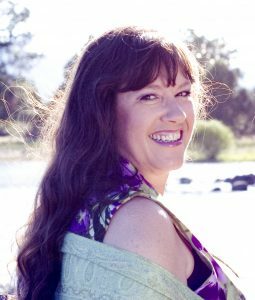 She’s written many stories for both middle grade and young adult. Her newest is Book 2 in the Touched by Afterlife series. 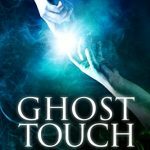 Guardian’s Touch releases tomorrow! Yippee. And you have a chance to win “One More Chapter” throw pillow cover giveaway. All you have to do is enter for a chance to win. Do it now! I had the pleasure of talking with LA recently and asked her many questions about her writing. But, before we get to that, I wanted to share a teaser about Guardian’s Touch. 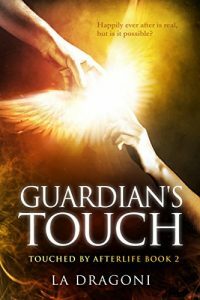 Now that your on the edge of your seat and can’t wait to read Guardian’s Touch, let’s talk with author LA Dragoni. JCC: Your stories are so creative, where do your ideas come from? Guardian’s Touch, the second story in the series is the next adventure for our main characters; Tamara, Dex, and Cal. I’ve always wanted to explore the question of what happens in heaven when a person remarries after losing a partner. I also have a time travel romance coming out in November, Again for Love. That was actually the very first novel I ever tried to write. But being a first time novelist, I couldn’t get through the middle. When I revisited the idea for NaNoWriMo (National Novel Writing Month) last year, it was a piece of cake to write, since I’ve basically been thinking about this story for…gosh, I don’t know…twenty-some years. I scrapped the original version, updated the characters, their jobs, their hobbies, and it was easy as pie – or beer, they work in a brewery. JCC: You’re so creative! I’m curious, as a young person, how did you spend your creative time? JCC: If you had to identify one person who sparked you to be the kind of writer you are, who would that be? LA: “One person, Joan? Seriously? Obviously there are a ton of people who shape the writer I am, my critique partners, the awesome support I receive from fellow writers, my husband and children. But okay, fine. One person. As cliché as it sounds, I’m going to have to say J.K. Rowling. I’ve always written, but it wasn’t until Harry Potter inspired me to finish my first novel that I ever considered writing professionally. Most days I’d like to thank her for the inspiration, but there are tough days when marketing efforts don’t pay off, or I get a less favorable review that I’d like to curse her with one of her own spells. JCC: Hahaha. Thanks for the one person. I know JK Rowling would be honored. Moving on, how do you go about writing your world view? What tips might you share? JCC: I love that attitude about writing. I, too, try to think of an unusual twist but, like you, I try to make it believable. So, given that, share with us what kinds of books you like to read? JCC: Wow! 100 books a year. That’s quite a feat! Particularly since you are also writing. How do you go about letting people know about your books? JCC: Why don’t you talk up Guardian’s Touch for a second. What do you like most about this new release? What a great interview! I know you can’t wait to read this new series. Be sure to visit LA Dragoni on her website and to write those reviews on Amazon once you read these great books. Thank you, LA, for join us today and good luck with your new release. Just a bit more information of LA Dragoni. Thanks for hosting me today, Joan. 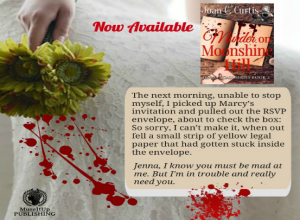 Your blog is lovely and it’s so much fun to visit with your readers. Readers, there will be 3 winners in the giveaway, so your chances are good. Visit my facebook page to see pictures of the prizes and to find links to other great hosts like Joan who I’m visiting throughout the week. Good luck in the giveaway and enjoy GUARDIAN’S TOUCH. Glad to have you with us LA. And I hope lots of people will enter to win! !